The 2016 CFL Draft is now in the books and the BC Lions had eight picks in the eight round draft. The Lions made a couple of deals with the Hamilton Tiger-Cats to get an extra pick, and did not have a pick in the fifth round of the draft. Here is our recap of all their picks. Trades: B.C. acquired the 5th and 23rd picks from Hamilton for the 3rd and 30th picks. They then reacquired the 30th pick and acquired the 32nd pick from Hamilton for the 21st pick. The Lions took a small risk when they selected a player that many had at the top of the mock drafts. 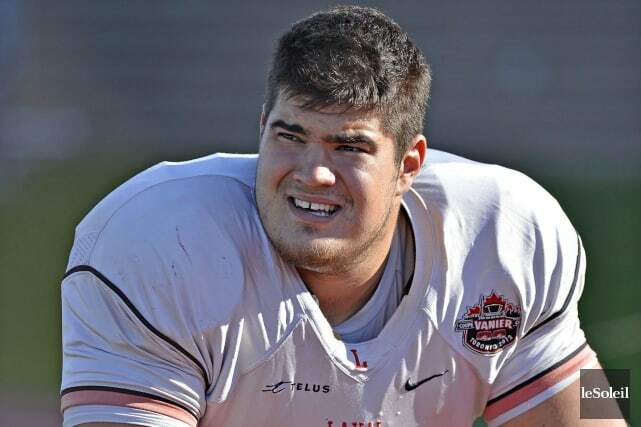 Charles Vaillancourt was one of the big three players available from the offensive line factory of Laval, and has drawn some NFL interest. He’s already tried out for the NY Giants and was not offered a contract, and he has a workout scheduled with the Oakland Raiders this weekend. Still, it was nice to see the Lions pick a guy who could start for them for years to come and not go off the board as they have done in previous years. Holding the number three pick, the Lions moved down to five, swapping picks with the Hamilton Tiger-Cats who selected offensive lineman Brandon Revenberg out of Grand Valley State. Vaillancourt should compete for a job right away in BC. He measures up at 6’4″ and 329 pounds and has a fan in TSN draft guru Duane Forde. “The offensive linemen out of Laval are technically sound. He has the size. They all did well at the (CFL) Combine, but he was the most-consistent of the three.”, said Forde, who had Vaillancourt projected in his top three. Vaillancourt should have little trouble getting comfortable at Lions’ training camp should he be there, as his coach at Laval, Carl Brennan, has been invited as a guest coach. The Lions see Vaillancourt as a possible future centre, and he’s played that position in the past. With the addition of veteran Tim O’Neill for this season, the Lions will have the luxury of easing him into the role at the pro level. I like this selection because the Lions needed to address their Canadian depth in the secondary and they did that with this pick. While I was hoping that Michael Corture would fall to the Lions at 12, Thompson joins fellow nationals Eric Fraser, Mike Edem, Keynan Parker and newly drafted Brennan Vannistelrooy in the Lions secondary. Thompson was the 15th ranked player and third highest rated DB in Central Scouting’s final rankings. He has good size and in 2015 played in all 11 games and starting in eight. He racked up an SIU best 55 tackles and posted a season-best eight tackles versus Missouri State and Youngstown State while recording at least one tackle in every game he played. Brett Blaszko addresses another need for the Lions and that was their national depth at receiver. He’ll have a chance to contribute right away if he has a strong camp. At 6’4″ and 215 pounds, Blaszko has the size and body type to add solid weight and be a dominant receiver. Following a recent tryout with the NY Giants, the University of Calgary Dino felt he wasn’t out-of-place. While he got off to a slow start in 2015 due to injuries, Blaszko was named an All-Canadian in 2014 and has been hitting the gym hard in preparation for his graduation to the pro game, and the Lions could have a beauty if his talents grow and flourish. This is where things get interesting. The Lions selected Dillon Guy out of Buffalo after health concerns likely dropped his stock. When healthy, Guy is a player that plays with a nasty streak and could be one of the steals of the draft. The big concern is a knee injury that kept him off the field in 2014, but the Lions had him thoroughly examined by the best in the business, Dr. Bob McCormack, when they brought him in 10 days ago. Combined with the addition of Vaillancourt the Lions have two promising prospects to beef up the interior of their defensive line and to push current projected national starters Kirby Fabien and Hunter Steward, who is trying to overcome his own injury issues. Not content with having one Shaq on their roster after drafting running back Shaquille Murray-Lawrence last year, the Lions went out and got another one in 6’0″, 190 pound receiver Shaquille Johnson. Johnson’s stock rose after a solid combine performance where he posted 4.39 time in the 40 and was impressive with his route running and catching. It’s been a bumpy road for Johnson on his journey to the pros. The native of Brampton, Ontario was the nation’s top rookie for the McGill Redmen in 2012 after making 61 catches for 792 yards and five touchdowns. Those 61 receptions broke the CIS rookie record of 57, which was set by Andy Fantuz, who of course has gone on to a great career in the CFL. Following that however, he failed a course during his freshman year, and wasn’t able to afford to take the course again. That made him ineligible to play in 2013, and he eventually transferred to Western. After playing for the Mustangs in 2014, when he caught 20 passes for 325 yards and two touchdowns, he was forced to leave school and work full-time to support his family. Not ready to give up on his football dreams, Johnson joined the Beefeaters last fall and made 30 catches for 606 yards and eight touchdowns in seven games. Johnson might be somewhat of a project, but his addition adds to the national depth the Lions needed at receiver. Again looking for depth in their secondary the Lions drafted former Okanagan Sun standout Brennan Van Nistelrooy. Van Nistelrooy brings impressive credentials with him accumulated while playing four seasons with the Sun in the British Columbia Football Conference. He was a four-time BCFC all-star defensive back and was named the BCFC’s top defensive back for three seasons (2013, 2014 and 2015). In 2016 he committed to the University of Calgary Dinos, and it’s likely that’s where he will play in 2016 after attending Lions camp in June. “Brennan is a mature physical player with outstanding football instincts. He was a leader on a very successful team and we look for him to contribute immediately,” states Dinos’ Head Coach Wayne Harris. 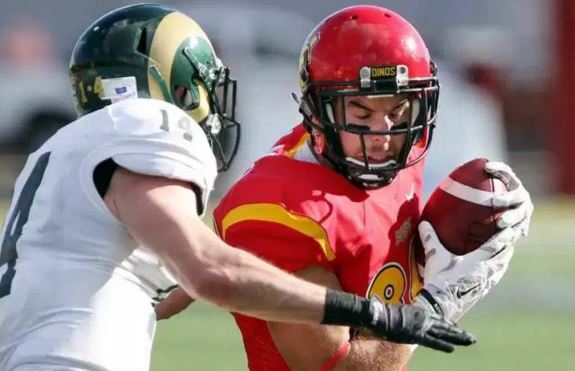 If Van Nistelrooy makes the Lions roster, it would likely be as a special teams player, but playing a year of CIS in a solid Dinos’ program would likely be beneficial before jumping to the pros. Rolly Lumbala isn’t going anywhere, but he isn’t getting any younger either, so the Lions plucked fullback Nathan O’Halloran in the seventh round out of Windsor. The 6’1, 226 pound O’Halloran looks to be a north/south runner and is good at catching balls out of the backfield. He also looks to follow his blocks well. O’Halloran also plays special teams, which is where he will need to cut his teeth with the Lions. He’ll have a solid mentor in Lumbala who is a true professional. Here are some highlights of O’Halloran’s work at Windsor. For their final choice, the Lions looked in their own backyard, selecting Vanier Cup Champion and UBC Thunderbird, Boyd Richardson. 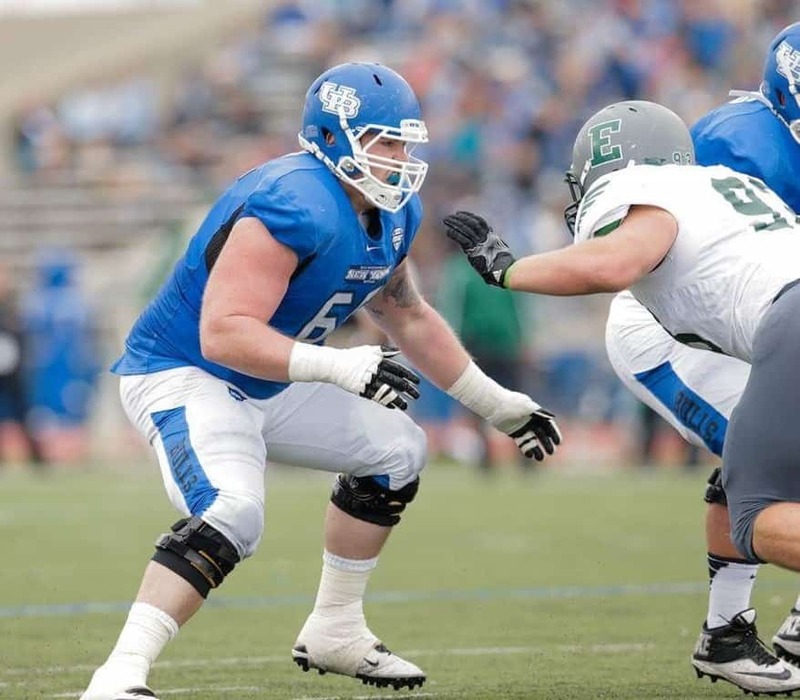 The 6’3 235 pound defensive lineman projects to be a special teams player to start his pro career. He has solid strength and was among one of four players at the combine to do 27 reps on the bench. Justin Dunk of CFL.ca says, “Richardson showed some power and with his current build he could be an interesting special teams type. If he added some thickness and bumped inside that might ultimately be his best spot in the CFL. Richardson is a native of Regina, Saskatchewan. As a BC Lions fan you have to be pleased that the Lions targeted three areas where they needed to improve their depth. The offensive line in particular has some promising selections in Vaillancourt and Guy, while the secondary and receiving depth were also improved. With the exception of Vaillancourt the Lions didn’t risk a pick on a player that was NFL bound, and hopefully for them, things will pan out with the Laval stud. It was a good day at the office for Wally Buono, and the only thing that would have made it better was maybe adding the likes of BC products Taylor Loffler, Michael Corture or Terrell Davis.